Updated Jan. 29, 2015: In fewer than five days, more than $1 million has been raised for Motts Hall Bridges Academy; that’s close to an IndieGoGo record! 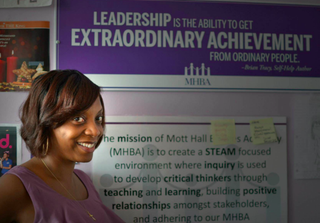 The initial goal was $100,000 to send MHBA students to Harvard University for a visit. Once it reached $350,000, it was determined by Principal Lopez and Humans of New York founder Brandon Stanton that anything over that amount would go toward creating a much-needed summer program for the school. Once the campaign reached $700,000, they announced that all funds going forward would go toward the Vidal Scholarship Fund, which will assist MHBA graduates with educational expenses. Vidal will be its first recipient. To donate to the Vidal Scholarship Fund, click here. His brown skin and twinkling eyes are what first captured my attention, his barely contained smile conjuring up feelings of forgotten innocence and memories of dodgeball and freeze tag. The warmth of his youthful face contrasted with the coldness of the city backdrop, making the image even more compelling. And as with most of the other images that come across my Facebook newsfeed from the brilliant Humans of New York blog, my eyes slid down to read what he had to say. During these tumultuous times of unchecked police brutality and black bodies scattered across urban streets throughout the United States, here was a black child—loved and supported—saluting his school principal for telling him that his life matters, and, in turn, telling her that she mattered, too. And to date the post, which has resonated with so many across social media, is closing in on 1 million likes and 130,000 shares. Brandon Stanton, the founder of Humans of New York, sought out Nadia L. Lopez, principal and founder of Mott Hall Bridges Academy, a middle school in the hardscrabble Brooklyn neighborhood of Brownsville, to make sure she knew how much she had enriched the life of the boy in the photograph—and wrote his own follow-up post about Lopez that has garnered, so far, nearly 60,000 likes. After meeting with Lopez and learning more about her vision, Stanton partnered with her to initiate an IndieGoGo campaign that will allow all incoming Mott Hall Bridges students to visit Harvard University. “I want my scholars to know that there is not a single place they don’t belong,” wrote Lopez. To date, the campaign, which began on Jan. 22, has raised $360,866 in 24 hours—361 percent of their $100,000 goal. Students will also be visiting an HBCU in February—-possibly Hampton University or Howard University—-a trip that was planned prior to the Harvard campaign’s launch. I caught up with the dynamic Principal Lopez Thursday to discuss the now viral image of her student. Our conversation eventually turned to education, inner-city blues and the reason she refers to her students as scholars. “I was sitting in a theater at a play, with my daughter, when I got a text from one of my former scholars asking me had I seen it,” said Lopez about the viral image. She was still at work, and I could hear the hustle and bustle behind her as we spoke. “My first thought was, ‘What did Vidal do?’—not in a bad way, but wondering why his face was on a blog. Then, when I read it, I was just humbled. Although Mott Hall Bridges Academy is located in Brownsville—Brooklyn’s murder capital and one of the New York City borough’s poorest neighborhoods—Lopez refuses to allow that stigma to cling to her students. We wear purple and black every day because that is the color of royalty. I want them to know their lineage, that they are descendants of African kings and queens, and to know their culture. Focusing on STEAM—science, technology, engineering, art and mathematics—rather than the more typically heard STEM, without the “A,” Lopez believes it’s imperative that children of color are able to express themselves artistically. After Lopez pitched the academy to the Department of Education in 2008, the school was finally given the green light in 2010. Since that time, two classes have graduated. But the school almost never existed. One huge problem, according to Lopez, is that limited access to options in Brownsville leads to limited imagination in her scholars, and she encourages them to dream bigger and to dig deeper. Lopez says that though she has been inspired by the #BlackLivesMatter uprising sweeping the country, she has long instilled that truth in her scholars. “My concern,” said Lopez, “has always been, how do they know that they matter?” She added, “How do we let them know that someone cares? What do we say to them? And that’s how ‘I matter’ became our mantra. That all changed in 2013, according to Lopez, when 1-year-old Antiq Hennis was shot and killed in his stroller around the corner from the school in a gang-related shooting. “We do five events a year now: Law and Order, because they’re angry, a lot of times, at law enforcement, and they feel like they don’t have a voice; Health and Wellness; Behind the Athlete, because they all won’t have the skill to play sports, but there are lawyers, NBA executives, athletic directors and sports agents; Financial Literacy; and Entrepreneurship,” she said. “They don’t understand that the clock is running against them. There is a system waiting for them,” Lopez said, referring to the ever-looming school-to-prison pipeline. As dedicated as Lopez is to her students, there are times when she feels overwhelmed. She credits Selma director Ava DuVernay with giving her the strength to continue her mission when she was in a very dark place. As previously reported by The Root, a collective of prominent African-American business executives created a fund that allowed 27,000 New York City students to see Selma free of charge. Of course, Lopez’s scholars were in attendance. I really, really want my scholars to win. Despite us being in a neighborhood that is tough, I want them to know that they can survive. Lopez believes that an education is every child’s birthright and makes it her business to connect the struggles her scholars face on a daily basis in Brownsville to a legacy of triumph.